Well they had nothing to say! I have heard nothing from Joules at all. I am pretty disappointed. BUT I haven’t given up, I am going to follow up with an email and see if that gets me any further. I am sure that they get many tweets each day but I was really hopeful that there would have been a fair few Fashion Revolution – who made my clothes? tweets sent to them and they would have responded even if just to say they would look into it. 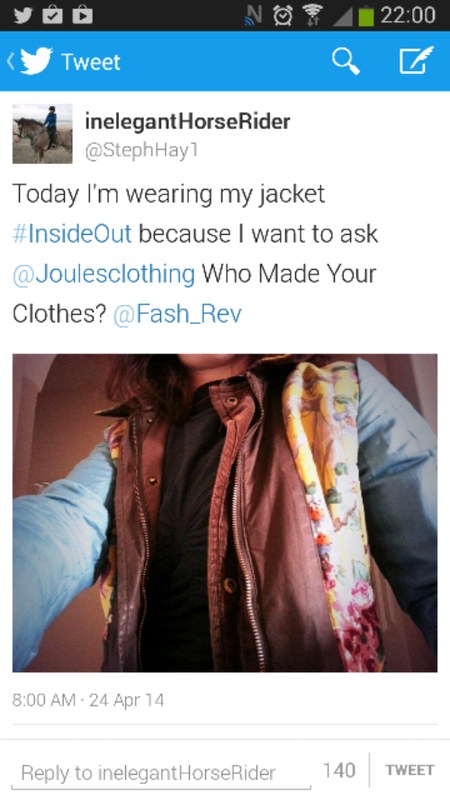 While I might not know who made my jacket yet I still love it and think it looks just as good inside out. Yesterday I was inspired by Franca over on Oranges and Apples and her beautiful blouse that she made herself but I am having to remind myself that I do not posses any skill with a needle and thread and need to start smaller. 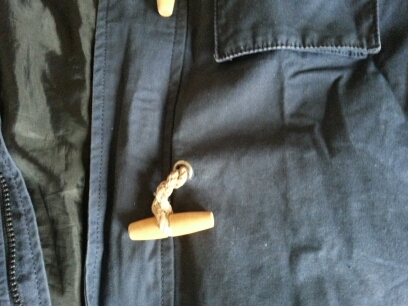 I managed to finally hem one of my pairs of jodhpurs in April – and while it is currently just hand stitched I am planning on a visit to my parents to borrow my mum’s sewing machine. I have a few more items to sew and a small hole has appeared in a new pair of exercise leggings that my mum kindly bought me so I will try to mend that as well. I am also planning to try and darn a grey wooly jumper that has a couple of holes in it, I wasn’t sure how to do it as it is a fine knit jumper – but I have been following Redressed on Instagram and last month was their mending month in their 12 month challenge and there were a fair few visible mends. I thought that this would actual look really pretty cool on the jumper using a contrast colour, I may as well try as I can’t currently wear the jumper at all! In April I had also planned on writing a review of the book Stitched Up: the anti-capitalist book of fashion written by Tansy Hoskins, I thoroughly enjoyed it. I then read this wonderful review by the lovely Emma Waight on Adore Reflect Sustain and realised she has written the review that I wish I could! So please head over, give it a read, buy the book and enjoy! 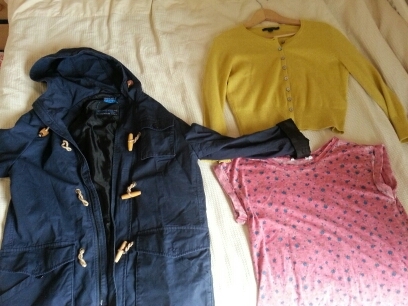 May has already included a clothes swap party where I bagged these 3 lovely items (the jacket is exactly what I was looking for). There is also a talk on 1940s fashion coming up, along with a vintage sale afterwards then a session on 1940s hair and makeup – it should be fun! 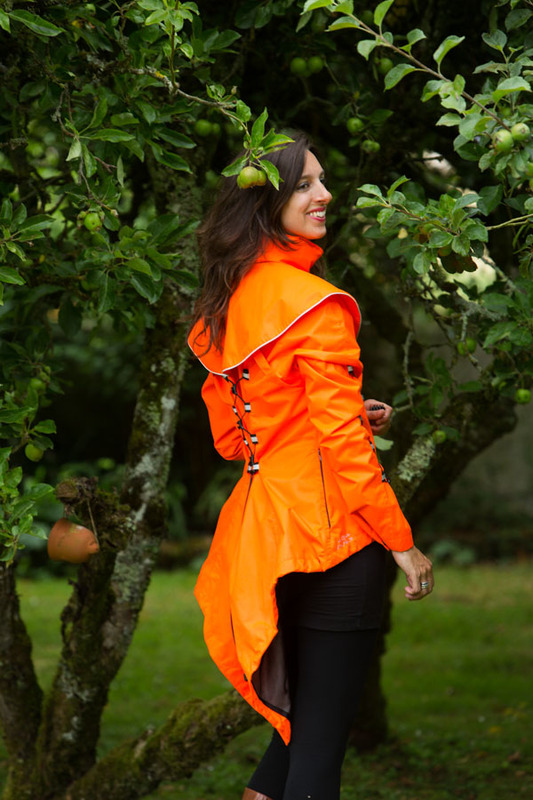 A Georgia in Dublin coat – it says for horse riding too so surely this is an investment right?? Maybe not in orange but this is an awesome jacket! Waterproof and quirky – I adore it.